Why wooden plantation shutters are getting popular? If you’re planning on installing shutters for your house, it is recommended to first compare the advantages of each design as well as material choices. And depending on the type of exterior shutters on your window, it will more than likely increase the value of your property. Exterior window shutters are an easy and affordable approach to boost your home’s curb appeal. Shutters have existed for centuries, and earlier they were made from wood, built for the decreased part of windows. They have also been used to raise the level of privacy in your home. 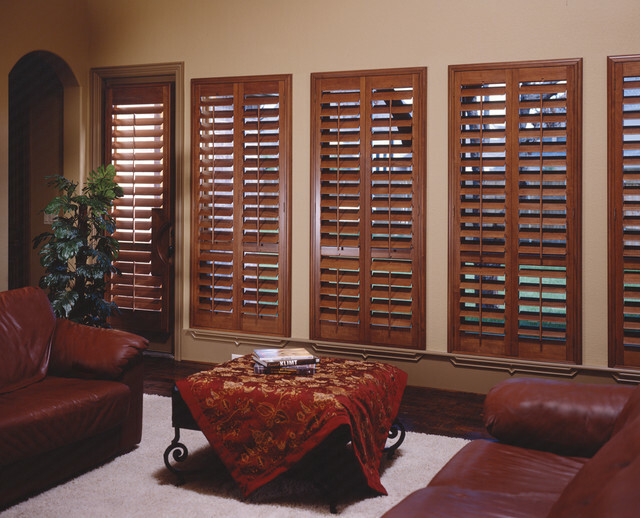 Finding the very best shutter is not a simple undertaking. Some shutters come fixed while some arrive with movable slats. Window shutters as energy efficient tools create a new concept altogether. The right kind of window shutters are energy efficient and will lessen the quantity of money you are using on power in your house. At present, there are numerous varieties of window shutters to pick from. We’d suggest you to buy wooden shutters and here is why. They can provide a beautiful accent to your home at minimal costs. You’ll find nothing like the look and feel of these. You’ll find lots of variations of wooden shutters, each with an exclusive look and style. Usually hardwood is used for making these. Basswood, Maple, Poplar and Oak have aesthetically pleasing finishes. They give you a nice selection to choose from and let you add a natural and more original appearance to your interior. Window plantation shutters primarily made using wood are a highly affordable option and also quite functional. They are window treatments consisting of a shading material that is added to the window to help in blocking noise from entering the room. Wooden plantation shutters are the way forward and that is why they make the most sensible choice. Unlike materials that aren’t friendly to the environment, such as plastic, wood makes for a great alternative for your interiors as well as for the planet. Wood has gained renewed popularity with the growing drives to go green in the present times. You’ll be surprised to know when you choose wooden plantation shutters you also play a good part in protecting the Earth. If at all you decide to change your shutters, you can easily recycle the old wood and have the peace of mind.